Becca Farley, left, and Sam Duvall work the counter at the Little Fish Brewing Co.’s new kitchen this past fall. Provided photo. 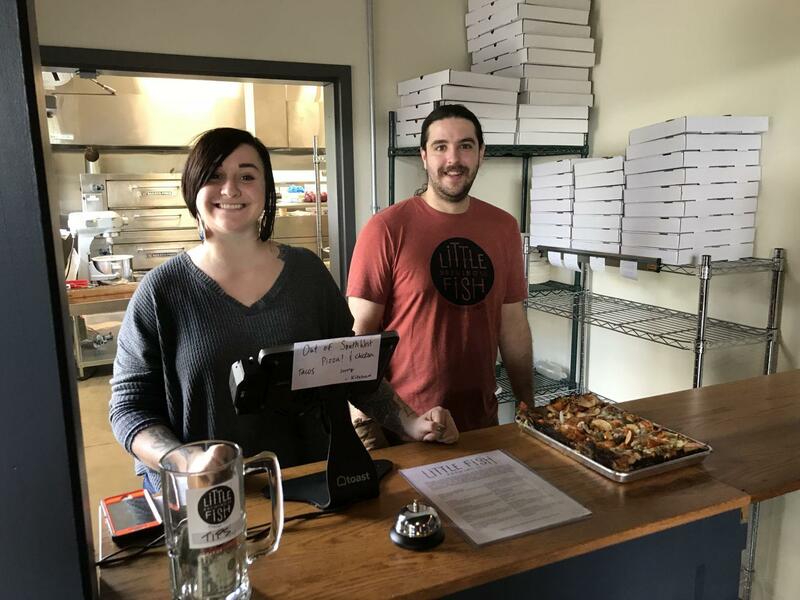 Little Fish Brewing Company recently hired a new interim chef to overhaul kitchen operations and introduce new foods at the local craft brewery and taproom. Chef Becky Clark, owner of Pork & Pickles and The Kitchen at Devil’s Kettle Brewing, has been implementing new, rotating menus for the brewery centered around deep-dish pizza and a variety of unique tacos. “Our goal is to make food-friendly beer and beer-friendly food and also elevate what people’s expectations of brew pub food should be,” explained Little Fish co-owner Sean White. The addition of a kitchen came to fruition after the establishment outgrew the food truck that was typically parked in its outside public area. This development resulted in the brewery doubling the number of employees to a total of 19, including White and his business partner Jimmy Stockwell. 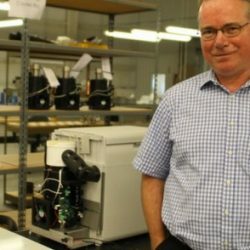 “It’s very gratifying and has always been a goal of ours to hire employees and give back to the region,” White said. Little Fish Brewing Co. opened its doors to the public in the summer of 2015 after two years of preparation and planning. Its foundation, as enunciated by the brewery’s co-owners, included a vision of sustainable products made possible with local support. Little Fish’s partnership with Clark will include Pork & Pickles’ charcuterie and pickles while also placing emphasis on the use of southeast Ohio agriculture. Clark is not full time at Little Fish. She will continue operating her other business ventures in addition to this most recent undertaking. Little Fish, located on Armitage Road off of Ohio Rt. 682 in northwest Athens, is hosting its first food and beer tasting this Valentine’s Day. It will include four unique dishes paired with four unique brews, including one of the latter that’s being created specifically with the holiday in mind, according to the brewery. “We wanted to open the kitchen with the same principles we use in the brewery, sourcing things locally and celebrating whatever’s seasonal,” White said. Little Fish is open seven days a week, starting at 3 p.m. on weekdays and noon on weekends. Clark is currently charged with creating a Friday lunch menu along with brunch options for Saturdays and Sundays.